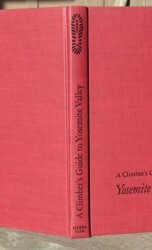 This is the first printing of the first edition of A CLIMBER'S GUIDE TO YOSEMITE VALLEY by Steve Roper. This book was published in San Francisco by The Sierra Club in 1964. 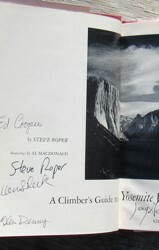 This example has been signed on the title page by Steve Roper, Allen Steck, Royal Robbins, Tom Frost, Glenn Denny, Ed Cooper, and Jerry Gallwas (Gallwas made first ascent of Half Dome NW Face with Robbins & Sherrick). Royal Robbins signature is a late-in-life version of being two linked capital Rs. It is the one above Tom Frost's signature. Robbins experienced some neurological afflictions in his last years making it difficult for him to sign his full name. 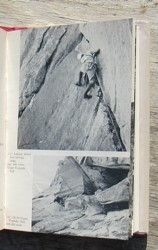 The book measures 190mm tall x 125mm, and has 190 +  pages, 39 b/w photos (of climbers in action), sketches, index. 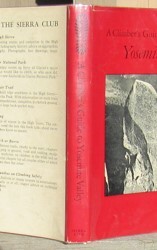 This was the first major climbing guidebook to Yosemite Valley. CONDITION: Original red cloth, black lettering front & spine, black decoration front & spine. Original dust jacket is in decent shape (two tiny 3mm tears front, minor rubbing spine ends with very tiny loss at top, complete with original price on front flap). The book is in fine condition with no previous owner marks or writing on any pages, clean covers, no rubbing, tight binding, no foxing. Price: $725.